Back-row forward Tommy Spinks says Jersey plan to play an expansive all-round game this season. 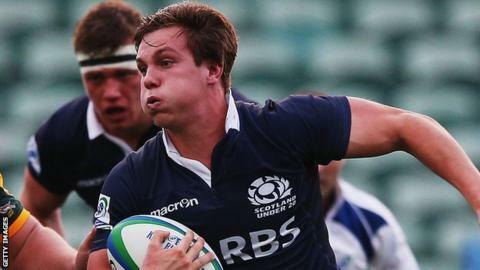 The Scotland Under-20 international joined the Championship side in May from Pro12 finalists Glasgow Warriors. "This season we're looking to play quite an expansive game away from our set-piece," Spinks told BBC Jersey. "I think we've shown that we can score some good tries. We've got a lot of pace to burn and we'll show that throughout the season." The Channel Islanders finished seventh in the second tier last term, their highest ever finish in English rugby. But Harvey Biljon's side lost 40-27 against Welsh side Scarlets in their most recent warm-up match, and face Blackheath on Saturday. "We've got a brilliant set-piece and it's something we're going to try and utilise as much as we can this year," added Spinks. "I think our defence needs to tighten up a little bit, so if we can work on that aspect then the whole thing will come together a little bit better." Meanwhile, Jersey's Sami Fisilau has become the first current player in the club's history to make a World Cup squad. The scrum-half has been called up by Tonga, alongside former Jersey forward Elvis Taoine.